Dimensions 0.50 by 7 by 8 in. Amazon.com description: Product Description: The last decade has witnessed a proliferation of artists whose primary medium is software. Algorithmic processes, harnessed through the medium of computer code, allow artists to generate increasingly complex visual forms that they otherwise might not have been able to imagine, let alone delineate. The newest volume in our Design Brief series Form+Code in Design, Art, and Architecture is a non-technical introduction to the history, theory, and practice of software in the arts. Organized into themes linked to aspects of codeârepetition, transformation,parameters, visualization, and simulationâeach of the book's sections contains an essay, code samples, and numerous illustrations. 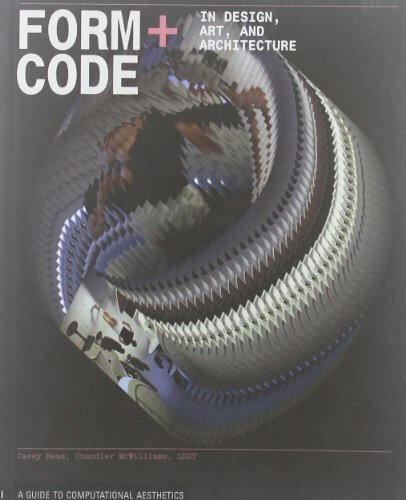 An accompanying website (www.formandcode.com) features code samples in various programming languages for the examples in the book. An ideal introductory text for digital design and media arts courses, this unique primer will also appeal to students and professionals looking for a survey of this exciting new area of artistic production. About: The last decade has witnessed a proliferation of artists whose primary medium is software.